Pictures of the closure of the Afsluitdijk in 1932. Power pilot installation: 50 kW. Current gain of 2,6 W/m2 membrane, should be lifted towards 5 W/m2. Potential for Dutch electricity generation: 200 MW. Estimated global potential: 5% of total energy consumption. Key technological challenge: combat pollution membranes. Osmotic power or salinity gradient power is the energy available from the difference in the salt concentration between seawater and river water. Two practical methods for this are reverse electrodialysis (RED) and pressure retarded osmosis (PRO). Both processes rely on osmosis with ion specific membranes. The key waste product is brackish water. This byproduct is the result of natural forces that are being harnessed: the flow of fresh water into seas that are made up of salt water. The King Willem-Alexander opens the installation (that is already operational for a year). Youtube text: Osmotic Power – The energy is based on the natural phenomenon osmosis, defined as being the transport of water through a semi-permeable membrane. This is how plants can absorb moisture through their leaves — and retain it. When fresh water meets salt water, for instance where a river runs into the sea, enormous amounts of energy are released. This energy can be utilized for the generation of power through osmosis. At the osmotic power plant, fresh water and salt water are guided into separate chambers, divided by an artificial membrane. The salt molecules in the sea water pulls the freshwater through the membrane, increasing the pressure on the sea water side. The pressure equals a 120 metre water column, or a significant waterfall, and be utilized in a power generating turbine. A 10 kW prototype was realized in 2008. A commercial scale implementation is expected to become operational in 2015. This is expensive technology. Reverse Electro Dialysis is the most promising technique method for extracting energy from the salt difference between sea and river water. The method is inherently sustainable and clean. In theory the Rhine river can deliver 6000 megawatt energy on mixing with the Northsea. Assuming an ideal process, there is no overall energy effect and the process is balanced by cooling the effluent 0.2 degrees or so. Extraction of a part of this 6000 MWatt is an exciting idea. According to a Dutch government source a 50 kilowatt pilot project will be realised and financed with 8 million euro. 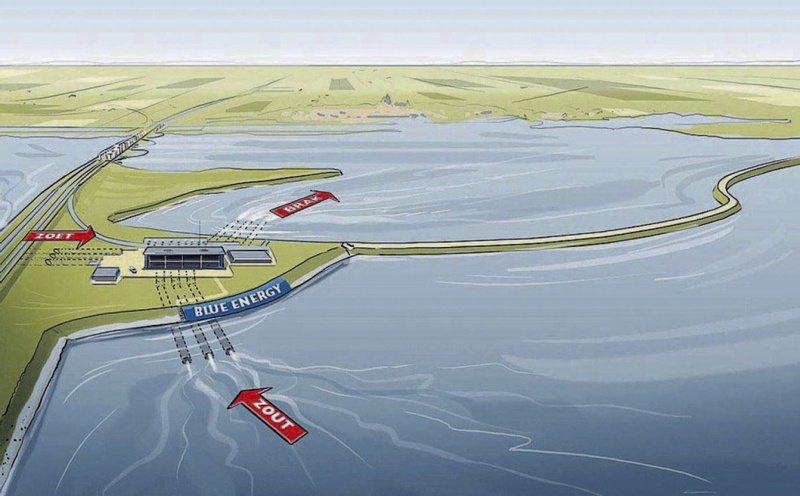 The potential for the Afsluitdijk is estimated to be 200 MW, but is not expected to be implemented before 2030.